After breakfast at the hotel, we caught the regional Bavaria bus to Hohenschwangau and Neuschwanstein castles. The ride was about 2 hours long. We were originally thinking about renting a car to go to the castles, but I’m very glad that we didn’t. Other than the stereotypical perspective by Americans on European driving, the roads seem much more difficult to navigate. Many roads twist and turn in unexpected ways. The roads too are very narrow. I was surprised that the bus route went through the areas of the villages it did as the roads seemed more like alleys. Once we arrived in Hohenschwangau, we located the ticket center. We had done some research prior to our trip that suggested that we reserve tickets in advance. I’m very glad that we heeded this warning. When we arrived in Hohenschwangau around noon, the line for tickets was easily an hour or more long. The reservation line however was only 5 minutes long. After getting our tickets, we opted for walking up to Neuschwanstein rather than taking the horse carriages. Again, the line for the horses was easily an hour long. The walk up is not too difficult, but it’s certainly not easy. 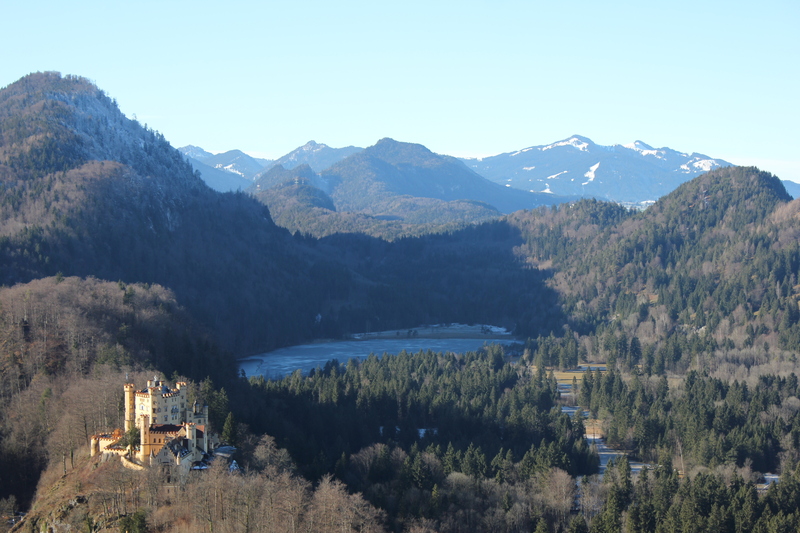 We were able to get a lot of pictures of Hohenschwangau and the other surrounding villages, as well as of both of the castles. We had time to spare before our tour by the time we got up to Neuschwanstein. The path to the bridge that overlooks the castle was closed, but we sneaked around the fencing and went over there anyways. (We certainly weren’t the only ones to do this.) The pathway was a bit slippery as I don’t think they groom the trail during the winter. Our tour led us through the finished rooms of Neuschwanstein. We saw some of the servants quarters, the king’s bedroom and dressing rooms, the dining room and living room, chapel, concert hall and kitchens. After the tour we had some time to spare prior to catching the bus home. We walked up to Hohenschwangau and got a few pictures of the castle up-close. Our bus ride back to Garmisch-Partenkirchen was an adventure to say the least. Our direct bus was running late so we got on another bus that said it was also going to Garmisch-Partenkirchen. The bus driver also confirmed this. However, when we checked the schedule online, we saw that we would have to transfer. We had a 10-15 minute window to make our transfer, and the bus we were on was already running 5 minutes late. At one of the stops, the bus driver suddenly got off the bus and ran inside of another parked bus. She tried to start the bus and checked the engine. She got back on our bus and manuvered it so that it would be able to jump the other bus. The bus started and she moved it forward a few yards before coming back to our bus. Meanwhile everyone on the bus was trying to figure out what she was doing, and worrying about if they would make their connections. We chatted with a German couple behind us who were also heading to Garmisch-Partenkirchen. Once she was back, we learned that the bus that we jumped wasn’t even going to be needed for another three days! We were now running over 10 minutes behind schedule. At the next stop, a pair of women got on. They realized that they had the bus tickets for their husbands who weren’t at the stop anymore. We found out that their husbands had gone inside to wait because the bus was late. Our bus driver ended up waiting for those two men to get back and catch the bus. An older gentleman sitting in the front was calmly yelling at them through his window to hurry up (“Mach’ schon”)and quicken the pace while making a running sign with his fingers. By this time we were supposed to be catching our second bus. Many people on the bus were also trying to catch the same bus as us. The man behind us informed the bus driver. She told us not worry. Shortly after, she phoned ahead to the bus driver and asked him to wait until we arrived. Once we caught that second bus, the trip back was not nearly as eventful. We got back to the hotel and spent some time relaxing. We went out for dinner at an Italian restaurant recommended to us by the hotel receptionist. We had an arugula, tomato and Parmesan salad followed by a tomato pepper pizza and caprese pizza. We noticed a few differences in German dining while we were there as well. Two ladies who sat down after us were asked to change tables in order to make room for a larger group. The table on the other side of us also showed no inhibition to sharing our table seasonings, olive oil or vinegar. Another thing that we’ve been noticing not only in restaurants but also stores was bringing dogs along and bringing them inside the store or restaurant rather than leaving them out front. After dinner, Adam thanked the hotel receptionist for the recommendation and checked on the Partnachklamm. We were informed that it was closed due to warm weather and the potential for falling ice chunks. I’m glad we checked rather than hike 45 minutes out of our way to find it closed for safety reasons.